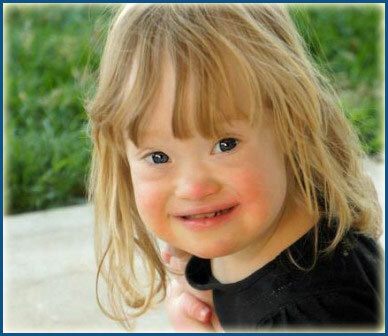 Four and a half years ago our 4th beautiful baby girl was born with Trisomy 21 (Down syndrome). Like many parents, I started looking for the best ways to help our daughter thrive. I contacted the local early intervention organization in Canada and, by four weeks of age, she had started occupational as well as physical therapy. Within the year, although very sporadically, she had also started speech therapy. I was pleased. Surely starting these interventions so early would give her a great start. Our daughter was fortunate to have the same occupational and physical therapists until the age of three, both of whom were wonderful and caring. As is common here, she had occupational and physical therapy about every six weeks, with activities to work on at home between each session. I was told that the purpose wasn't to help our daughter to reach her milestones faster, but to help prevent her from developing bad habits while reaching those milestones. Our daughter's therapists meant well and I respect them in many ways but they still had the commonly held belief that "kids with Down syndrome will reach their milestones in their own time". I struggled with this because as my beautiful little girl was encouraged to reach her milestones "in her own time", typical babies were already starting to progress faster. I am a compulsive researcher and when the usual books that are recommended for babies with Trisomy 21 did not reveal the answers I was searching for, I kept looking. I turned to the internet next and after some searching, started to hear about some kids with Trisomy 21 who learned to read and do math when they were only preschoolers. As they grew up these kids were smashing preconceived notions about Trisomy 21. I admit that I was very skeptical at first. Until this time I had never heard of any child , genetically enhanced or not, being able to read at the age of three or four. Skeptical as I was, I was also intrigued and spent hours searching to the furthest, cobwebbed corners of the internet to learn as much as possible. By this time, my daughter was around six months of age. I was still skeptical but I reasoned that even if my daughter didn't learn to read as a preschooler showing her flashcards with words and pictures would allow her to spend more time face to face hearing me speak and talk about the cards. I included pictures on the back of the cards, so if nothing else, she would learn the meaning of the words along with the vocabulary. At the time it felt like a giant leap of faith and it wasn't until a couple of months later that I finally shared this "far fetched" notion with my husband. As I continued with the reading program I decided to start some other aspects of neurodevelopmental therapy and ordered some books on the subject, gradually implementing my own program. One of the next activities I introduced was a crawling track, and while I had to wait quite a while to see the results of our reading program, the crawling track gave us positive feedback within a very short time. We built the track daughter was about 7 months and she was crawling at eight months of age. This was the first real success that told me that our decision to pursue a neurodevelopmental program was having a posiitve impact. According to several milestone charts, on average, kids with Trisomy 21 crawl at fourteen months while typical kids crawl at around 10 months. While it is difficult to give absolute credit to our daughter's neurodevelopmental program for all of her achievements, I have no doubt that her mobility was greatly improved by her crawling track. The reason that learning to crawl is so important to me is that a whole new world is opened up to a baby who is mobile. All of their senses are stimulated as they see and feel new things while exploring through crawling. This initial success spurred me on to research and implement more neurodevelopmental activities. My husband and I were very careful not to test our daughter during this time. We provided lots of input but because we wanted learning to be pressure free, fun and the start of a lifelong love of knowledge , we did not test. It was a long year and a half wait but shortly before our daughter turned two she started to read words out loud. By the time she was three and a half she read her first short story and, one year later, her reading vocabulary was tested at just below a fourth grade level. She is now a few months shy of her fifth birthday and although her reading vocabulary is higher she enjoys reading at about a mid grade two level for fun. She loves Robert Munsch and reads our quickly growing library of his stories regularly. When our daughter was three we decided to pursue an evaluation with a neurodevelopmentalist. We now go three times per year for an evaluation and follow a program designed to meet her specific needs. We did a pretty good job with our home program but the professionally designed program is very well rounded and covers every aspect of her development. As I said in the beginning I was very skeptical but, after researching and seeing the results of our daughter's program, it really makes sense to me that if all kids need some stimulation to progress that kids with Trisomy 21 would progress faster with even more. It is common knowledge that in past years when babies with Trisomy 21 were sent to institutions they did not progress nearly as well as those who were brought home and raised in loving families. I think the reason that neurodevelopmental programs are so helpful is that not only do they offer much more stimulation than a child would typically receive but they also help the child's brain to reorganize so that it is able to utilize that information better. While we put a lot of importance on getting the daily activities on our daughter's program done we also do not stress if we have to take a day, or even a week off. If we don't accomplish as much of her program as we feel we should be able to on any given day we are okay with it and just start over again the next day. We are a busy family with four daughter's and feel it is important to balance our daughter's program with the needs of the entire family. We try to get most of the program done while our older daughter's are in school while other activities such as having our daughter read stories fit in well at other times like our bedtime routine. It can be difficult at times but we gradually getting better at creating a balance. Today we are so grateful for the path we have chosen for our daughter. There are some areas that we still need to work on. For example, although we are able to understand her and she often speaks in 6 or 7 word sentences, we are working on her articulation. Physically she is doing very well and has always been either ahead of or at the early end on the Trisomy 21 milestone charts however it is noticeable in a group of her peers that she doesn't run as fast or jump as far. On the other hand, academically, she is much more advanced than any four year old that I know. Besides reading so well she is doing math at about a kindergarten level and is able to find all of the continents and many countries on a map. She is able to communicate clearly and talk about everything from her recently conquered fear of heights to what happened today at preschool, what activities we did on a recent holiday and what her favorite clothing choices are. She is able to read a menu in a restaurant, order and discuss her choices with the waitress unassisted. Physically, she runs, jumps and her latest accomplishment is riding her tricycle. Our daughter goes to a typical preschool and has taken swimming lessons independently. She recently started playing T-ball and I'm sure the coach has no idea that she is sporting an extra chromosome! We'd love to hear your experience with a therapy that you have found worth the time, money and energy please write to options4DS@gmail.com.